Windmill Animal Hospital? Please click here! Everyone at windmill is always so kind and helpful! I'm so grateful Dr Price was confident to take the risk to perform an unknown surgery and saved my furry baby's life! I'll forever be grateful!!! Great and caring staff. I know my animals will be WELL taken care of. Recently I brought mine and my husbandâ€™s boys to stay in your hospital over night since I had a doctors appointment in Dallas. We canâ€™t begin to tell you all who took care of our Chihuahuaâ€™s Little Dog and Gus how very much we appreciated the attention and care that you all gave both of them. We couldnâ€™t have children, so these are our children, our boys. Thank you so very much for realizing what they mean to us, and how very much we worry about them when we are gone. The texting was Awesome to find out how they were doing. I must say that the way I was treated the day before, and then was made an appointment to bring the boys in to see the place, and to get to know everyone was the most personable experience I have ever had at any veterinarian hospital. The girls up front made me feel so special, and really seemed to know how important it was to me that our boys be treated with lots of love, and they were taken to potty as often as I asked, and the water was used that I brought because they put it back in the carry case I had brought with me. That was so much appreciated, it just shows your hearts are in the right places for these little guys and for their parents as well. Amy took her time showing me the place and explaining everything in detail, and her gentle kind ways were so much appreciated. Please never change your policies or your caring ways, and you all will become the best veterinarian hospital any where around. God Bless You All for taking such good care of our boys. We will definitely be back because of the care and the professionalism, and love you all have to give. And also it really does smell good too! Thanks again from the bottom of our hearts to you all. You guys always treat Inky as the little miracle kitten that she is. We totally appreciate that. Friendly, professional, competent and caring staff and doctor that are willing to take the time to explain treatments and options for preventive health care. Modern and clean facility, grounds and equipment. My wife and I have felt very comfortable trusting Windmill Animal Hospital with the care of our newest canine family member. Jake actually likes to go to the vet's! I was impressed right away with the great customer service on the phone and when I arrived for our first visit. The facility is beautiful & clean. The staff acknowledged me as soon as I walked in. From the front desk to the tech and Vet, this team has it right! The care my dog received was outstanding. They took great care of her and I felt comfortable leaving her with Windmill Animal Hospital. Perfect as usual...the only vet hospital I do not dread coming to! Very friendly and helpful staff that know what they are doing. Excellent care at Windmill Animal Hospital! Staff are always nice to our pet and us. They are patience in their explanation to new pet owners. Dr. Price is excellent on what she does, incision on puppy spayed looks clean and well done.Excellent care at Windmill Animal Hospital! Dr. Price really takes the time to explain all of the options and put you at ease. The rest of the staff is great too! My little dog Rio is recovering from major surgery at Windmill Animal Hospital under Dr. Price's watchful eye. I want to thank all Employees that have a hand in his recovery. Rio is getting top notch attention,He will be home soon . I get an update every day on his condition which eases my anxiety. Thank you all so very much at Windmill. Wonderful staff & doctor! Thank you for a clean and enjoyable vet experience! Thank you Dr. Janice and Staff! Bella got her staples out today, and her tummy looks great! Thank you again Dr. Janice and staff! We have a happy mama and babies! The staff and doctors there so great. Exceptional care and consideration! Thorough beyond measure! Humans can only dream that our medical doctors would take a page from Windmill Veterinary's "playbook" for dedication to detail and bedside manner. I was very impressed with the staff at Windmill. I just started using them and had only had one visit to get my dog her shots. Then our precious baby girl got pregnant and I can't say enough about how the staff and doctors were extremely helpful through the entire process. Including me calling several times just to ask questions. And then the day came for birth. Being new at this I called several times and ended up having to have an emergency c-section for her. The staff is very knowledgeable and caring and made us feel comfortable going through the entire process. I would highly recommend them to anyone! We love Dr. Price and her staff. We love Dr. Price and her staff. They took such good care of Sophie and provided vital info regarding her ongoing care. The staff and Doctors of Windmill Animal Hospital are the best! I would not consider taking my dog anywhere else! Highly recommend the entire gang! My dog gets super excited everytime we go to the vet! Very helpful and friendly staff! Very convienent. I would not take my dog anywhere else. My Basset Hounds had a good experience staying with Windmill. I tell everyone who asks how wonderful the vets are. The facilities are state of the art and I know Scarlett and Beau get A-one treatment when we leave them there. Everyone associated with Windmill is so nice and caring. Absolutly Outstanding Service and Care! The staff at Windmill are always extremely friendly and professional. It is easy to see that they all love animals and want the best for your pets. I would highly recommend Windmill. We took our small poodle mix, Squirt, today, April 4, 2013, for the first time to the Windmill Animal Hospital for a lst time exam. Squirt is 2 1/2 yrs old and we switched to this hospital and we are so glad we did! We saw their TV advertisemen and the entire staff looked friendly and the entire staff looked to be friendly & a caring group which was proven to be true today at our visit. The hospital was so clean and yes, it 'smelled good' as the TV ad pointed out. The staff were very professional and they made us feel as a part of the Windmill Animal Hospital family. We highly recommend this hospital. Thank you! The ladies were great as always. I know my pets are in good hands with them. The staff is great! Always polite. I felt comfortable knowing Remy was left in such caring hands. They explained everything thoroughly and answered all my questions. I recommend Windmill to my friends w/ an animal family. I admit the prices aren't very competitive but the facility is always extremely clean, never smells like a pound and is top of the line. The vets are extremely helpful and willing to educate their clients. The techs are very friendly and knowledgable. As far as prices they don't blind side you with them and my estimates have always been fairly accurate. The clinic also provides military discounts, which helps. The front office staff has always been courteous and helpful. The only criticism that I could possibly say is that one of the front staff appears to be afraid of certain breeds because of a past experience, I respect that but if this makes her uncomfortable enough to express herself as that then she needs to address it with staff and not clients. However I wouldn't trust another vet in town with my pets over windmill. They truly are the best. Worth every penny and all my praise and recommendations. I have never reviewed any business but this establishment deserves the effort. The staff are so friendly and attentive to your pet. I have a huge Alaskan Malamute and barks at every dog so they hurried me thorugh and gave us a treatment room. Super clean and humanized for your pet. Their latest technology with surgery will ensure your pet is safe and has a speedy recovery. Definetly will continue to be a patron at this clinic. Well Done Windmill Animal Hospital! Everyone seems to really love animals and that's very important to me. My dogs are like my kids and I think Windmill gets that. A good veterinarian is priceless! ABSOLUTELY THE BEST!! Love all the Staff & Doctors! Fantastic staff, excellent care. After our move to this area from DFW, they went above and beyond to make us comfortable. I just want to thank Windmill Animal Hospital for taking care of Shelby Brannon. She acts like a puppy again at the age of 10 years old thanks to the program that put her on to help her spine pain. Ya'll are awesome. Love that I can drop my dog off and pick him up after work. You're located in a great spot! Dr Price is fabulous, she is very thorough and hands on. Never once did I feel our appt was rushed, even with how busy it was. Raider had several procedures done, and we couldn't entrust anyone else with his care then the staff here. They are great, caring,and on top of it. Super impressed that I have finally found a practice in this town worthy of handling my pets care. We are always pleased with Windmill. I appreciate the time and effort that was put into my pet. Dr. Price went out of her way to contact another vet for assistance. She was very comforting to me. We felt very comfortable taking our little Mini kitty to have her surgery at this office. The facility is CLEAN, technologically above any other vet clinic in Abilene, and the staff are just WONDERFUL, very caring, very professional. We have found our new vet clinic for all of our four legged babies!!! We would recommend this facility in a heart best. In fact, we already have. I was highly impressed with Windmill Animal Hospital on our first trip. Our Golden Retriever had scratched her eye rough housing with our Danes so I called and made an appointment for a Friday. Well come Wednesday I didn't feel she could wait any longer so I called to see about moving the appointment up and they squeezed us in even though they were booked. We were in and out in an hour, WITHOUT AN APPOINTMENT! They were so kind and gentle with Kisses. They won me over! We will definitely be going back! Thank you WAH! Excellent service as always. I just love this place and so does my dog. We are very pleased with the care Maddy receives at the Windmill Animal Hospital. Dr. Price and all her staff are very professional and compassionate. You can tell they really care about their patients. We would definitely recommend the Windmill Animal Hospital to anyone who wants the best for their pet. Thank you all for taking such good care of our baby!! Radier had to have a blood test and I had a dentist appointment so they let Radier stay with them until I got my appointment finished. Thanks for doing that. Great experience -- loved how Dr. Price took time to explain everything! Thank you so much for taking care of Beretta! You are all a joy to see and talk to! The staff is really nice, welcoming and greet my pet and I with smiles.The vet is welcoming as well and is helpful with any concerns or questions I have. I will continue to bring my pet here. All went well; everyone is well organized. Pricing is comparable to all other quality vet clinics. They treated my dog like he was theirs. All the staff are friendly and happy. Will return. Wonderful group of people! You can't find better care anywhere! The best examination my dog has had. I very much appreciate the care taken with my animals and the level of expertise of everyone involved. Very friendly and enjoyable. I felt our dogs were left in good hands for boarding. Every request for care was done when we picked up dogs. A good explanation and reasons for recommended follow-up care for Biz (13 1/2 yrs. old) was given. I felt the care and treatment of the both dogs was the primary concern, and the staff was very kind to animals and customer friendly!! I love the staff and they always take great care of my dog Bella! This is the best vet in Abilene! I have tried countless other veterinary clinics and Windmill out-does them all. They value my pet and my experience more than my money, and they are always showing care and compassion to both my dog and me. They even call after every appointment, just to check-up and make sure we're doing okay! AMAZING service and incredible people! It was a great experience as always!! Absolutly love this vet. Everyone is friendly and awesome with my 4 legged kids. Thank y'all so much. My pet is doing very well after his procedures. He is energetic and lively despite his discomfort during recovery. Would definetly continue taking pets here. Nice welcome and a feeling of personal interest in Kylie. There was an obvious problem with my cat, so I called Windmill Animal Hospital. They said to bring Phoebe in immediately. They diagnosed her health issue, gave her the medical care she needed, and then had us pick her up. The next day she was already acting her old self and obviously feeling so much better. I am thankful for Dr. Price and the staff at Windmill Animal Hospital. LOVE THESE PEOPLE! They go above and beyond to care for my bassett and treat us all so well! Highly recommend!! Always a pleasant experience to bring my "baby" to Windmill Animal Hospital! Fantastic as always, All my 4 dogs go to Windmill for everything they need. Dr Price and the staff are WONDERFUL ! Written by: Pete Frame, Jr. I absolutely love Windmill. They take such great care of my babies. They obviously love their work and animals, and re always upfront and honest with me about my pet care. Don't k ow what I'd do without Dr. Price! The staff really went above and beyond to help my dog feel happy about being there and treated me with respect as well. We love Windmill! Your kindness and professionalism cannot be beat! Tara Scarlet loves to see you, except for the weighing part! We are so glad we found you! We are pleased with Dr. Price and her staff. They are always helpful and caring. Everything went very well, and we were pleased with the great care Murphy received. Raider loves going to stay at the Windmill. He also got groomed during his stay. Everyone is so nice there........and it smells good! Rollie was thought to have a breathing problem when he went to Windmill for grooming, an attempt at which failed at PetSmart only a month earlier from which Rollie returned home with only his upper half cut. Due to a pre-exam by the Windmill staff and, I suspect, kind and conscientious handling on the part of the groomer, Rollie came back properly groomed, relaxed and calm. During a pre-exam the vet had approved a sedation if he became excited before the grooming, due to professional handling, this was not necessary. Thank You for an excellent and professional visit. In Rollie's case it provided extra comfort knowing that a vet was on site at the grooming facility. As always the staff and Dr. Price we welcoming and friendly. They treat Buddy like he is family and in return he Loves them all and is glad to see them. And it smells good, too. Thank you for taking such good care of my sweet fur baby. I felt very welcome and the service was great. I immediately felt like I had been going to this place for a long time. Dash enjoyed his visit. The exam was thorough. The staff is thoughtful and caring. I came back in to follow-up on my cat Smokie and everyone seemed to really care about the well-being of my little sweetie. Smokie didn't freak out because everyone was so gentle and loving to him. Great job! I am confident in the knowledge of the vets and the techs. I will keep coming back and encouraging my friends and family to go as well. Thank you! Lucy always looks so good after her grooming, and gets so excited when I say "Windmill". As soon as I say it, she runs straight for the garage, and god forbid I'm not quite ready. lol We just love our friends at the Windmill. Even though I got bad news that my precious baby tested positive for heart worms, the staff was very caring and nice. This was my first visit to the vet in many years. I called around for office visits estimates and called back, even though your office visit was a few dollars more than others because of the way I was greeted and spoken too on the phone. The kindness I received when calling was the deciding factor on my new vet! Thank you! We were visiting and had to take our RV in for service. The staff was amazing and kept our bird and Great Dane for the day! The staff is amazing and go out of their way to help! I like the service, facility, and the vet. The staff is very friendly and always welcome you with a smile. However, I wish they had weekend grooming services or earlier drop off times during the week for grooming services. What a great staff, it was nice to see someone who really cared for my dog. They greeted us when we walked in and told us what we needed to do to get my dog to lose some weight. Boy it is working, they love the new treats and green beans. My dog and I both love Windmill! Excellent service from a friendly staff that knows what they are doing and really do care. They got Raider right in and got rid of his itchy skin..........they are always so nice to Raider. Thanks for seeing him. Also I love the shirt! I was so happy with the experience I had at Windmill Animal Hospital. I felt like everyone there really cared for my feelings and the well-being of my cat Smokie. He is doing great and I have a lot of confidence in this place. I will strongly recommend to all my friends and family to go here! They really care for the animals! Very, very pleased! Terrific and caring staff......a God send for my Cosmo. Always take their time and let me know what it will cost before any procedures done!! Staff is amazing and very helpful.... Highly recommend! It's such a relief to find a vet my animals are comfortable with! Usually, when I take my kiddos to the vet they can't wait to get out of there. One of my dogs will paw at me and literally push me towards the door, the other just whines. When I brought them to Windmill they calmed down almost immediately. My pushy dog was wagging her tail and my whiney one curled up and took a nap! This is unheard of for my 4-leggers! The staff was wonderful and very patient! They took a lot of time going through records to verify my animals had all the right shots (age appropriate and so forth), the best heartworm, flea & tick meds, and food options. I am very impressed! When I paid somehow I paid for my puppy's heartworm meds and walked out without it. Not sure what happened...I almost didn't call, but when I did they were very friendly and let me know I could come get it anytime! Being military we have had to establish new vets every move. I have to say so far this was the smoothest and most through transfer yet. Finally, I feel like someone is there for my pets and now this pet mom can relax! Always get the best attention here. Staff really loves animals. Have had pets all my life and they are the best! Excellent care!! Always very professional, thanks so much for caring for her just like she were your own family. Dr. Price is a true professional, up to date on the latest procedures for caring for our four-legged family members. The staff is friendly, courteous, and experienced. Kimberly, the receptionist, always offers a sincere smile as a warm welcome. It is a true pleasure taking our two dogs to visit Windmill Animal Hospital. Thank you, Dr. Price, for choosing Abilene and for hiring the best staff in town. Took Willie, my St Bernard, to get a good bath and hair cut yesterday. He looks GREAT! They did an amazing job, he looks, smells, and feels wonderful. Not only do I think the groomers did an amazing job, but I absolutely love the staff! They are great at customer service and satisfaction! I'm very glad to have found them when we moved here. The kindest staff and best care anywhere!!! Truly love this bunch!! Wish some human doctors' offices were as nice and accomodating! Always had wonderful experiences at Windmill, I would recommend it to everyone! I've never had a vet look out for my dogs weight. Dr. Price showed me how over weight my dogs are. The dogs are so annoyed with me right now but I know it's for there best. Dr. Price knows her stuff and is proactive about getting their health under control. The staff is also very awesome. If my dog loves it then so do I! :) thanks to everyone there for making the experience a great one! Fast service with smiles and they followed up! Amazing service. We moved to Abilene recently and not knowing where to take our dogs for good quality care certainly added to our stress. After researching online reviews, Windmill Animal Hospital outrated all the others, so we chose to give them a try. We now understand why they had 100% positive ratings. The facilities are absolutely premium, but what impressed us the most was the staff. We have two Schnauzers, one has heart issues, so finding the best care facility was very important to us. Dr. Price's credentials, knowledge, professionalism and great personality to boot, was exactly what we were looking for in a veterinarian. Her staff is also very accomodating and professional as well. Comparing our previous experiences with vets in other cities, we can honestly say that Abilene is extremely fortunate to have this level of expertise and care available for their beloved pets. Can't wait to take advantage of their in-house grooming services. It's the complete package in one place. I had a concern with my cats and they helped figure out the problem and fix it. Everyone is friendly and they make you and your pet feel at home. Thanks for everything you do. Staff is excellent at Windmill. They make my sweet baby girl feel so important & loved. She loves coming to see everyone there! Our Corgi had to have a tooth removed last week and I was very impressed that they called to check on him the next day and throughout the week! Not only was Dr. Price very thorough in explaining how his procedure went, his techs and office staff are EXCELLENT! I wouldn't take my babies (we have two Corgi's) anywhere else! Nora says,"Thank you Dr. Price for taking so much time to help me today! And thank you for leaving the nice warm light on me too!" She really liked that! And mom says thanks for taking such good care of my baby and for having such a clean and odor free facility! We appreciate all y'all there! Truly the best Vet I have ever used. I have 3 big dogs, the staff and Dr Price know me and my dogs by name, they always do a wonderful job. If you love you pets taking them elsewhere is a disservice to them. Fantastic service and facility. The staff showed they really cared for my cat and my husband and I when we visited. They laid out all of the options and prices upfront so that we could make an informed decision. I was very impressed with the clean facility and the friendliness of all of the staff members. They are all so fantastic, I can't say enough. Everyone was great! You all helped put Blaze at ease with your caring ways. I could tell that you all love animals. Thanks. Dr. Barnhart is great!! After experiencing Dr Price and her crew one that loves their baby such as we do would never consider going anywhere else!! They are sooo sweet, compassionate and helpful for anything you need or ask. I love the hearts of the whole crew. Hearts like this don't come everyday. So, for this I say Windmill Animal Hospital and Crew are a Godsend!! We love you all!! Puppy paw high five!!! They took great care of my sweet baby. Kept me updated on her status and made me feel easy about her surgery. Great staff!! Ace loved all the attention he recieved from everyone. I did get alot of very good information for his diet and we have already started on it.See yall in 2 weeks. Our little Lucy loves going to the Windmill. She is in great hands from the medical care to the grooming. We could not be more pleased with the entire staff. With Lucy's allergies and grooming, they're becoming almost like family. (But without the weird uncle and arguing.) Can't say enough good things! I move a lot, so I have to take my dogs to many different vet offices. Windmill has been the best by far in the last several years. Their customer service is top notch - they'll go above and beyond to help me every time, and whenever my dogs stay there they are healthy and happy. Great care with acknowledgable staff. My dog is back to herself. A very enjoyable experience for my dog and myself. Top notch service. Great customer service from all the staff we came in contact with. Especially the Tech and Vet very caring and patience with Missy and Rita. VERY IMPRESSED. We asked to cut him shorter and she did and it looks good! Raider stayed 2 nights with you and also was groomed. I feel so good when he stays there. He looked so good after grooming also. Everyone is so nice when we walk in the door........love it! Dr. Price and her staff have been amazing with all four of my dogs! They treat us as family and I know my furry four legged kids are always in good hands with them, Dr. Price has chaned the lives of my dogs and has added many more wonderful years to come with them just by doing more research than the norm. If you value the lives of your pets and love them as much as we do ours you can always be reassured they will do their best! It's nice to finally find a vet in town that truly cares about your animals and dose not view them as just "dogs". The staff was very friendly and the facility was very clean. I look forward to our future visits. I am incredibly please with the care we received for our cat Mow. We were able to get a same day appointment and get her into surgery same day as well. The staff and Dr. Was wonderful and made my children and i feel comfortable, as well as treated our pet gently. Dr. Price and staff are all so friendly! After a year of misdiagnosis and treatment elsewhere we found Dr. Price and our lab is finally back to his old self! We have had nothing but good experiences here and are so thankful to have found them! This was my first visit there and it was great. I felt that they took my concerns for Georgie seriously and was very nice to her. Thanks to their care my little girl is back to her old self. I see a long vet relationship there. Stopped by to pick up a prescription and as usual, I was immediately greeted like I was family! Even though Kimberly was busy she still ask me how Karlee was doing. I love the feeling of knowing that everyone at Windmill loves my Karlee too! Dr. Price is "priceless"! Best I have visited with, very personable, and on the cutting edge with treatments. AWESOME experience!!! Like the staff, Like the smell, Like the service!! Very clean. Friendly staff. Upfront about charges. We're new to town and read the reviews for Dr Price and decided to Windmill a go. So happy we did! Their whole office from the front desk to the treatment and meeting Dr Price was 5 Star all the way! I know our babies will be well taken care of! I even had a technician help me out to the car which made my day as I had my hands FULL! Would recommend to anyone! Always gr8 experience & ur peeps r so friendly & patient! Thx! Windmill continues to provide the most outstanding veterinary services I have ever experienced. I recommend them to all my friends. They go out of their way to make sure you and your animal(s) are taken care of and I like how you are provided an estimate and options ahead of time. They actually were able to squeeze both my girls in that day due to a cancellation. Everyone is always so friendly and I know my girls are well taken care of. They were a bit of a mess from the summer, but looked beautiful. I highly recommend! We use Windmill for our vet, grooming and boarding needs. They are wonderful. We've had so many bad experiences and it is so nice to finally have all our needs met under one roof. And it smells good too! Bucky was relieved after his treatment, but what I appreciate most is Amy's advice to change to Hill's w/d food. It turned out I was doing all the right things for our 4 furry babies like measuring and timing meals, but their old food was high in fat. We're new to Abilene and we're so happy to have found such a competent and friendly clinic! The staff is is friendly. They go out of the way to comfort the owners when our pets are sick or injured. The doctor is competent and thorough. I'm glad I found this vet's office. I had Raider groomed yesterday and she (Kameron-ed.) does such a great job. They are always so friendly there. Thanks for getting Raider back to looking good!! Everything was great. They are all very nice. The Best I have ever used. Thanks Dr.Price for getting our rescued puppies on the right track to a good healthy and fun life with Bill and I. We noticed Joey was having trouble going potty. And at the same time his stools were runny and left messes behind that were clinging to his fur. After wiping him repeatedly for days we realized that this was not a result of something that he had eaten. We took Joey to Windmill Animal hospital where Dr price was able to diagnose the problem immediately. Her vast knowledge as a veterinarian has been a tremendous relief for us and our dogs. Joey is on his way to a full recovery. Thank you once again for your loving care of our family pets. The staff at windmill animal hospital was very curtious. They treated Kate and i very well. It was the most pleasant experience that i have had at an animal hospital. We tried this vet for the first time and was very impressed! We will most definately be going back! Wow! Windmill exceeded my expectations. Everyone was so friendly, cared for my cat so well, and great communication. The vet and staff were very caring people and explained all of the options. Highly recommended!! Windmill Animal Hospital staff is very friendly and the grooming was excellent. every time we have visited the windmill it has been a pleasure, we were greeted with smiles all around. moving our pets care to the windmill was one of the best moves we have made for our pets. Our experiene with Windmill Animal Hospital has been like a whole other level of veternary and boarding service! From their "pre-boarding" visit (which, because we were in a last minute travel situation - they were flexible, explaining the goal of the "pre-boarding" visit is to ensure our family, including our dog, was happy and comfortable - but that they would work with us however we needed to accomodate our unexpected travel), to the clean & modern facilities, to the time & care given when explaining the latest options in medicine for our dog - all was top notch....and frankly, a level of care that is what I hope will become a new standard....we are so pleased! Vet and staff took the time to get complete information on our pet. They were patient with her and gained her trust. The exam and treatment went very well. I am pleased with our visit and will return our pet for regular checkups. Windmill Animal Hospital takes great care of my pets! They love going in and getting the best pet care anywhere... and it smells good too! 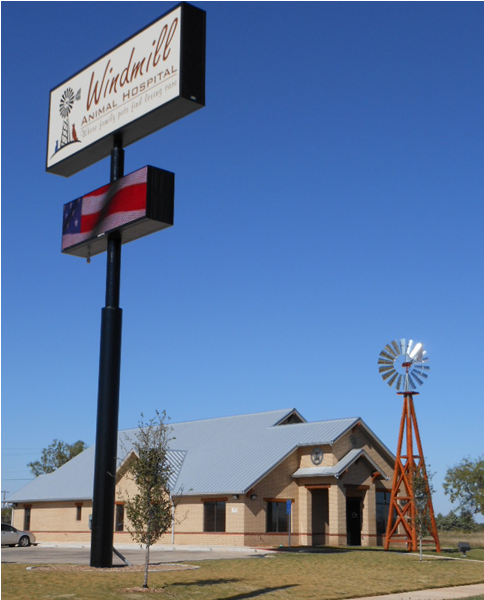 Windmill is the BEST vet clinic in Abilene! The staff is so nice and actually knows what they are doing! They were great with my dog who can be difficult! I'm so happy to have found a vet clinic where the employees seem to love their job! Great place would recommend it to everyone! My dogs and I love this place! Kameron works her magic again! I dropped off 3 "rag-a-muffins" yesterday morning and picked up totally transformed pets that afternoon! Thanks, Kameron, for taking such good care of our babies and making them look so great! As in the past, I appreciate the way that the staff genuinely cares about Karlee. The way they treat her and talk to her can not be faked. It is always a pleasure doing business with y'all! PS: It is also nice to be able to actually talk with the Veterinarian directly. Thank y'all so much for what you do! My precious little Yorkie, Tucker, receives the absolute BEST care from Dr. Price and her staff! I recommend Windmill Animal Hospital to everybody I know that has a pet. The entire staff is always friendly and loving with my "baby". The facility is immaculate, smells great, and truly gives the best care of any vet I have ever gone to...they are in a class above the rest! Took our guinea pig to Windmill Animal Hospital with very itchy skin. They were very thorough and friendly, will definitely be using them in the future. This is my second experience with Windmill, and my second time leaving with a feeling of comfort. My Lab decided that Miracle Grow "Organic Plant Food" was delicious, and ate some, we brought her in to see Dr. Price & Dr. Barnhart, and they took extremely good care of her, shes doing great, and getting back to her old self again! GREAT experience with Windmill Animal Hospital! The staff is amazing, the facilities are outstanding. I will definatly take my pets there again. Very satisfied. Everyone was very nice. I was very satisfied with the visit. They answered my questions thoroughly. Every visit is always enjoyable. I LOVE THE FACT THAT WINDMILL ANIMAL HOSPITAL SPECIALIZES IN DOGS AND CATS. I FEEL LIKE IT IS BETTER QUALITY CARE FOR MOST FAMILIES PETS. I WOULD NOT CHANGE VETERINARIANS NOW THAT I FOUND THE FINE FRIENDLY STAFF WHO TREAT OUR BABY TRIXIE LIKE SHE IS ONE OF THEIR OWN. THANKS FOR SAVING OUR BABY'S LIFE, WE WOULD BE LOST WITHOUT HER!!!! I came in for a refill and to refund Certifect. I have found that Certifect is a terrible product compared to regular Frontline. Windmill credited my account and refilled my dog's prescription with no problems. My dog was bitten by a rattle snake. Called Normal vet and they would not see him. Remembered passing by Windmill, so I gave them a call. It was already 6 and they said bring him. Great staff who truly care about their clients. Will be calling this place my new home for Vet needs. Buzz loves to go to the doctor! He gets so excited when he visits. He doesn't even mind the bloodwork. Clean..treated well..fast friendly service..dr very helpfull and informative! I walked into the fresh smelling clinic and instantly felt as if I ere at home. They ere very caring and allowed my bird to come out of his kennel on his own instead of making me get him out. Gotcha talked to them and NEVER does that with any strangers. If you want family to care for your pet, look no further! Being that this was the first time that Kyiah has ever had surgery, we were nervous about the whole experience. Dr Price and the vet techs were great when it came to questions and the entire surgery process. Choosing the laser as to the normal process was the best decision we could've made and we thank you for having that as an option. It's been 3 days since the spaying and Kyiah is doing great, thanks to Dr Price and all her staff. I would like to thank Dr. Price and her staff for taking such good care of Buddy. His nose looks good and he can breath again. I'm really glad you came to Abilene and I brought Buddy to see you. I think with you taking care of him he will have a much healthier life. All of the staff is so friendly and caring. It is also a pleasure to come into a CLEAN office and be greeted by friendly people. Thank you again.